The Parisian club, hosted Premier League’s Chelsea FC for the first round of Champions League knockouts, and the packed Parc des Princes Stadium, didn’t regret this cold winter’s night, outing. Both teams gave a convincing performance, not always at the same time, but interesting though and they certainly kept the suspense till the end. Chelsea scored on their first real chance( 36th); Terry’s cross to Cahill, backheel to Ivanovic wich scores a very improbable goal, but that’s Football ! Paris equalizer was a perfect cross from Mathuidi to Cavani, who beats at last Chelsea’s goalkeeper Courtois. 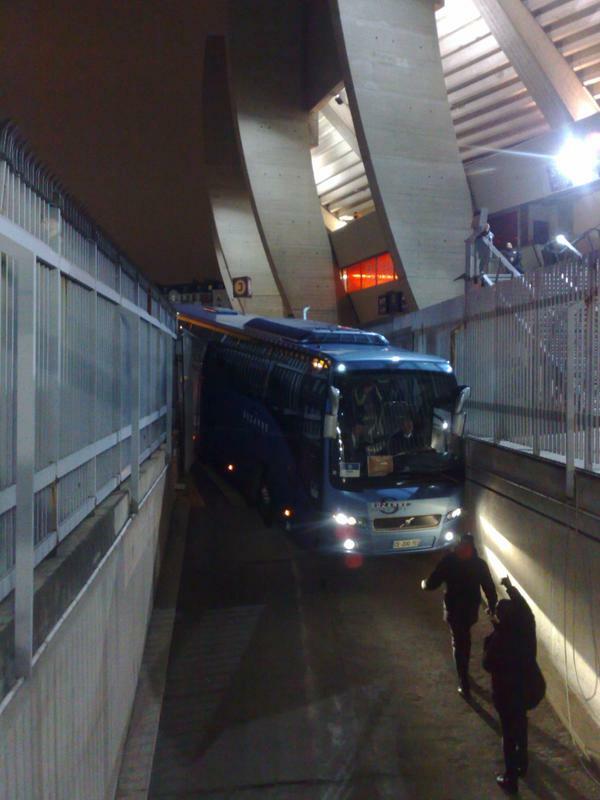 The Parisians had more opportunities to win the game (Lavezzi 60th, Luiz 66th,Cavani 81st) but Mourinho’s “Blues” are very good on parking the bus, even if the real one had some problems with PSG’s parking space ! Anyhow, Chelsea left France, taking in their luggage a very good result( 61% chance to qualify) and Laurent Blanc’s Parisians having had produced a good convincing game, some hope for the second leg, at Stamford Bridge. PSG’s Man of the Match: Marco Verratti : Monsieur 93% succesful passes, but not only that; the Italian international, was the most involved player of the Parisian side, good on counters, he recovered lots of balls from the Blues and often forced them to foul him. Very aggressive, he was the one who set the pace of the game, for PSG. Salvatore Sirigu : 6/10 : The Italian stopper, had a quiet evening, but the 36th minute, when abandoned by his defense, conceded Ivanovic’s goal. Gregory Van der Wiel : 5/10 : Not a bad game, but not a good either; some good crosses and bad luck…the goal was conceded from his side. Thiago Silva : 7/10 : A good game from PSG’s skipper; very much involved during the first half, less in the second, a bit tired after working so hard to keep Diego Costa out of the French half? Mission accomplished. Marquinhios : 6,5/10 : The 20 year old Brazilian, produced a good game and dealt with Hazard’s incursions efficiently. Good, solid player. Maxwell : 5/10: The Brazilian international, was average, at the least. Some good deeds with Verratti and Lavezzi, but nothing more exciting; got problems to keep succesfully his side from Chelsea’s incursions. David Luiz : 6,5/10 : Laurent Blanc’s surprise at kick-off ; he was solid, (some mistakes though) recovered many balls and had a good chance to score(66th). Blaise Mathuidi : 7/10 : A good game, from the French midfielder; an opportunity to score (10th) plus an assist for Cavani’s goal. Very much involved in defending and attacking, he was very valuable on the pitch. Ezequiel Lavezzi : 5,5/10 : A solid game from the Argentine’s International; very good on set pieces, he could score in the second half, but he wasn’t able to help efficiently his teammates. Subbed by Javier Pastore (81st). Zlatan Ibrahimovic : 5,5/10 : He had several chances to score (12th, 45th, 59th, 91st, ) but missed them. Powerful though, a good omen for the second leg in England. ‹ Mouez Hassen, Goalkeeper: Don’t Forget This Name !